Daphnia and fish for sale for delivery to the CCA meeting this Saturday April 13, 2019. Please respond in a reply below with questions or what you want me to bring to the meeting. All fish and cultures are home grown, tank raised. Daphnia is $5 a bag. Microworm culture in a plastic box is $5. A starter is free to PVAS or CCA members and consists of a tablespoon of an old microworm culture so you can start a new one. Ask for the starter if you want this. Rotifer culture is $5 for a pint of an existing culture in a fish bag. Vinegar eel culture is $5 for a culture in a plastic box and includes a harvesting sponge. Red cherry shrimp are $15 for a group of 20 or more. All angels are adult fish. Chindongo demasoni are $5 each for fish that are about 2 inches Adults are available. Corydoras aeneus (bronze corys) are $4 each for young fish. No adults available. Corydoras oiapoquensis are $8 each for adults. Corydoras weitzmani are $8 each for adults. Corydoras panda are $6 each for adults. 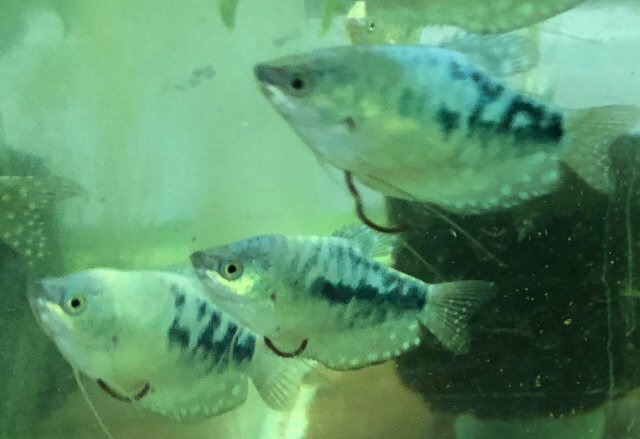 Opaline (blue) gouramis are $4 each for young around 2 inch fish. ANCISTRUS sp L144, Black-eyed Yellow Bristlenose Pleco $10 each. Frank, are you out of Celestial Pearl Danios? I just sold the last 10 CPDs, but there are some very young ones coming. I think there is only one adult available right now. I'll take 5 bags of Daphnia. Thanks! If not too late can I get 5 bags of daphnia?